Why not relax and thaw out from the winter chill in a cosy chalet for 2 people or a charming self catering lodge for four to six people? Musangano Lodge boasts of thatched accommodation and is centrally positioned for day trips either to Honde Valley, Nyanga or the Bvumba mountains. For those en route to the lovely beaches in Mozambique, why not stop over for a night with us…? Travel leisurely, enjoy our stunning views and good food and continue your journey refreshed early the next day. Game drives: US $10 per person (excluding park entrance fees). Contact our team now to get these great rates. Matobo Hills Lodge is situated within a private wildlife reserve bordering Matobo National Park (50km from Bulawayo). Matopos hills is an area of exquisite beauty, the lodge’s accommodation units are built upon a granite outcrop with sweeping panoramic views over the surrounding hills. There is a separate lounge/bar which commands spectacular 360-degree views of Mount Ififi and the Maleme Valley. For any new bookings of 3 nights or more, an awesome rate of $99/person/night sharing for accommodation and all meals. Activities, drinks and parks fees are not included. Rhino Lodge is situated on the shores of Lake Kariba, a massive manmade lake formed by the damming of the mighty Zambezi River in the late 1950’s. It is also situated within the Matusadona National Park, a remote wilderness area which has been designated as an Intensive Protection Zone for a small but successful population of the endangered black rhino. Jacana Gardens Guest Lodge in Harare is proud to announce it has been awarded the 2014 Trip Advisor Certificate of Excellence. 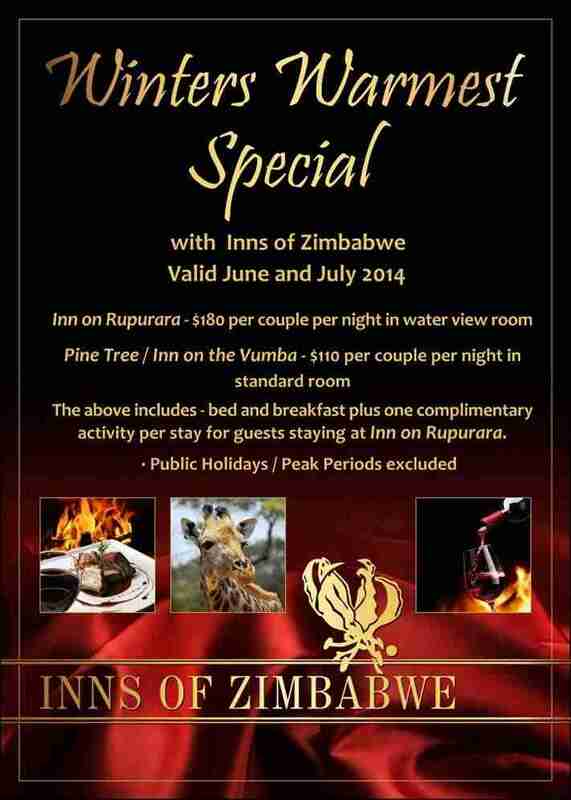 To celebrate this award, we are offering a WINTER SPECIAL of US$ 60pps (incl breakfast and VAT, excl 2% levy) for the period June 15 – July 31, 2014. This excellent lodge, Dutch owned and managed, is situated on a quiet and secure one acre property within the Golden Triangle of Harare’s Northern suburbs, just a 5 minute drive from Sam Levy´s Shopping Village and offers small-scale luxury for a maximum of 14 guests. This great special offer of just $199 per person per night (children under 12 are half price) includes accommodation in a garden room, all meals, teas and coffees and two scheduled activities per day. Offer valid for travel from 1st June to 31st July 2014. The rate is based on a minimum of 2 (two) people sharing a room and excludes all beverages, spa treatments, shop purchases, sundry activity fees (National Parks entry fees) and transfers to and from the lodge. This special rate is only applicable to Zimbabwean Citizens or holders of valid residents permits and is only guaranteed on a strictly first pay first serve basis. Bumi Hills Safari Lodge first opened in 1975 and is a famous, well-loved luxury lodge that overlooks the massive Lake Kariba. The panoramic vista is sublime and it is impossible not to exclaim “Wow!” when stepping out to the pool area upon arrival. This astonishing sunrise-to-sunset 180-degree view, from a hilltop overlooking the game-rich shoreline, may be relished from the pool, bar, dining deck, Kukondwa Spa, fire-pit, wine-bar deck and the private verandas of all 10 premium rooms. This Lake Kariba Safari Lodge has been totally revitalised to luxury levels never seen before, including a breathtaking signature infinity pool. Bumi Hills Safari Lodge re-opened in September 2009 and today offers 10 Premium and 10 Standard rooms complemented by so many awe-inspiring experiences in an authentic African eco-wilderness.